My heart goes out to those affected by last night’s tragedy in Paris. Sending prayers of comfort and courage. I know the shock of learning that the people you know are held hostage. God help them all. It is the time for the Governments to rethink and rewrite their policies, and for us people to remain human. This post is not a review of Alexandre Dumas book. 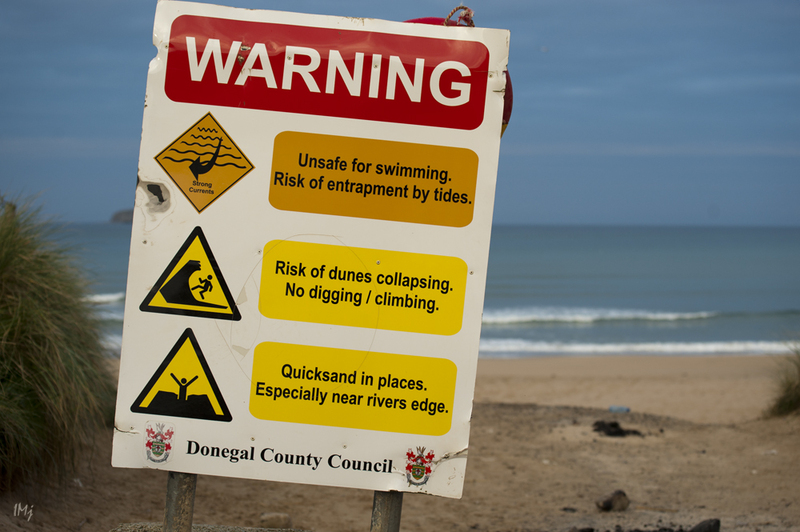 Last time I was in Inishowen in 2005, ten years ago. Just caught in the life, I guess. In 2005, we drove up to the Malin Head, the most northerly point of Ireland, turning from Derry clock-wise around the coast. Somehow I have lost almost all my photographs from that trip, but there is one I want to talk about. I remember driving a very narrow road winding up the hill, and then, suddenly, this magnificent view opened like a window onto another world. It was quite windy, and the long, lush grass was moving in the wind, making the slope under our feet look like green fur of some giant animal. I was mesmerized by this mysterious beauty. For years, I was dreaming of coming back, but I had no idea how to find the place. In Google Earth, I found the church and the graveyard, but couldn’t figure out where the road goes. 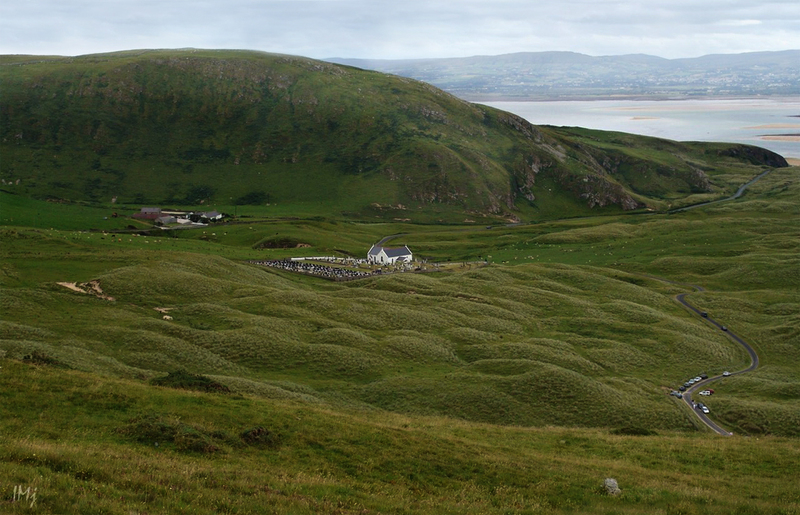 With a tip from Brendan Diver, I finally learned the name of the place – Knockamany Bens. Early in the morning, before hitting the road back home, I drove north, my heart ricing with excitement. I felt like I was heading to a reunion. And finally, ten years later, I was standing there again, with the only difference that my camera was upgraded to a full frame model. The majestic view was the same. 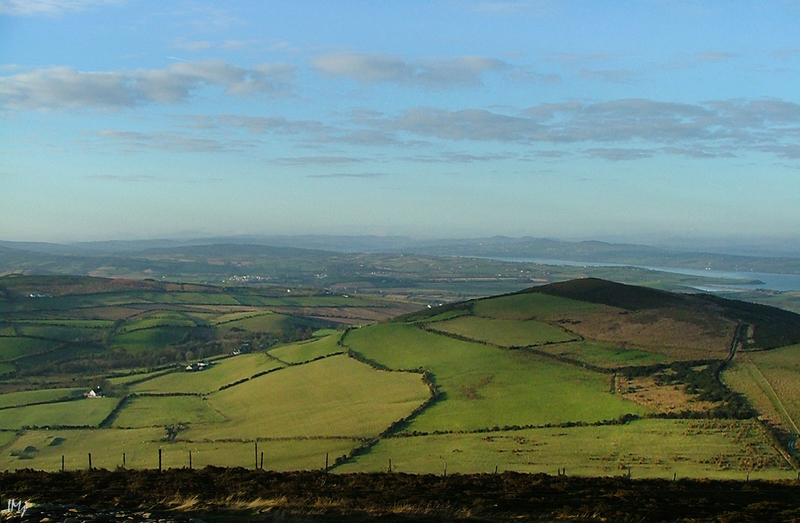 From the viewpoint you can see a nameless hill (presumably Cranny Hill; check out http://www.diaryofadonegalgent.com/), Lagg village and chapel, Five Fingers Beach, and an inlet from the ocean, called Trawbreaga Bay. 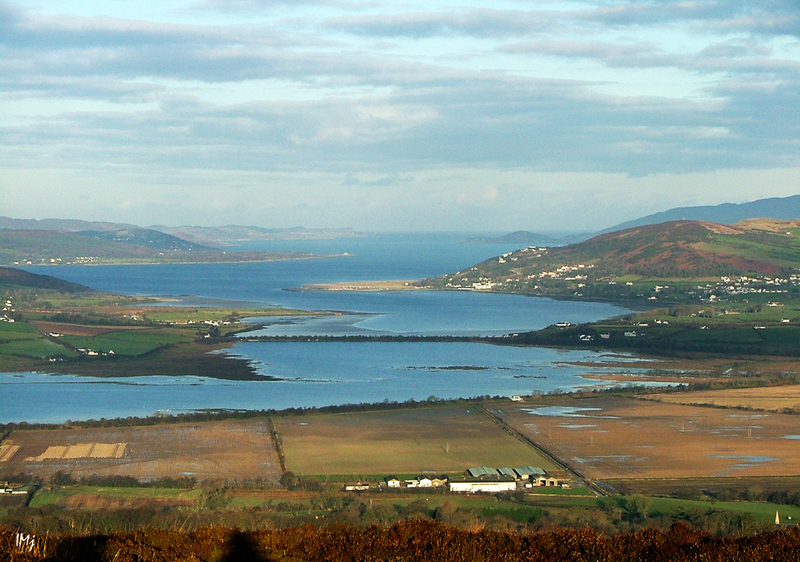 Across the water, there are the Doagh Famine Village, islands of Glashedy, Binnion, Dunaff and Fanad, and the highest point, Raghtin More Mountain. Below, two more photographs taken from the viewpoint car park. Across the water you can see the beach where we had the Elena Shumilova Workshop photoshoot I wrote about. Good bye Knockamany… Hope to come back some day. My project for 2016 is ‘Mizen to Malin‘ cross-country photography trip. One last photograph, October 2015. 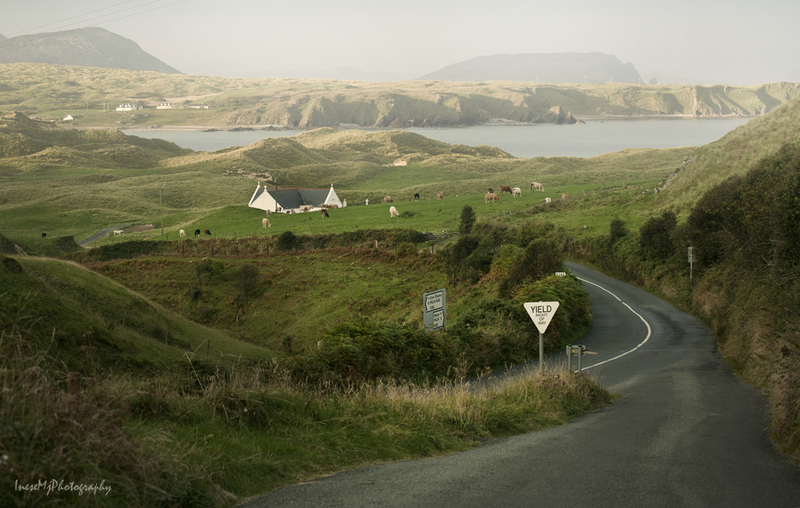 If I followed the road, I would eventually get to the Malin Head. As it commonly happens in our life, the journey is much more spectacular than the destination. 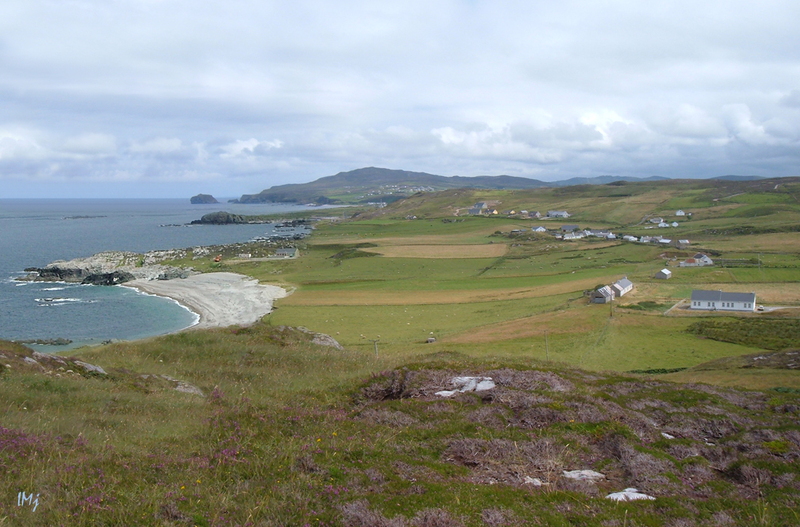 This is Malin Head, July 2005. We didn’t explore much at that time. The trip was a detour after traveling around Northern Ireland. 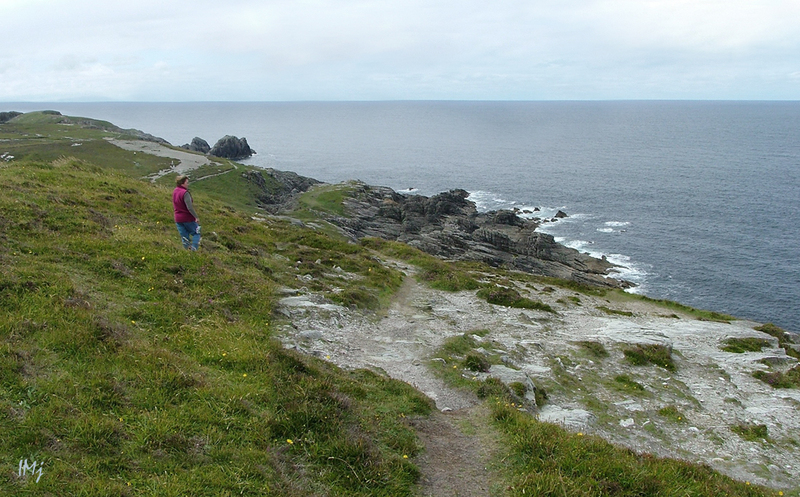 Another picture from Malin Head, and a bit of history. 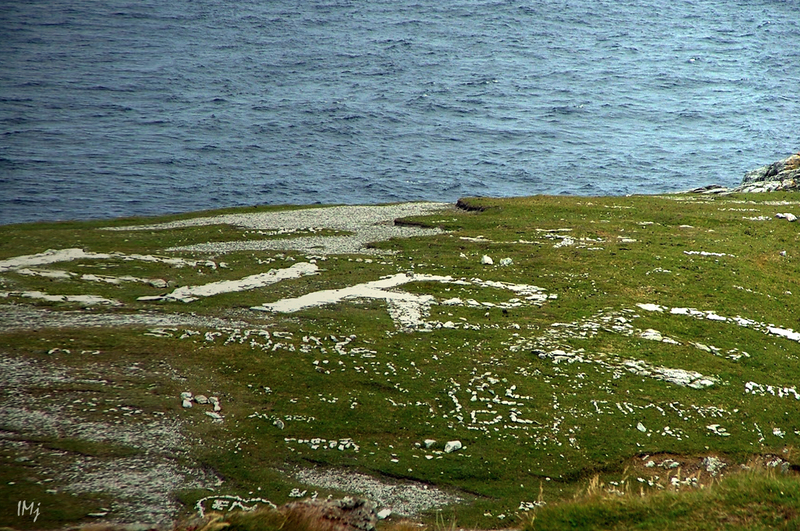 The ‘EIRE’ sign, painted on stones below Banba’s Crown tower at Malin Head, was a symbol of Irish neutrality during World War Two. The sign was a message to World War Two pilots that they had entered neutral territory. The Battle of the Atlantic began on September the 3rd 1939, 250 miles North West of Malin Head. German U-boats and submarines torpedoed both cargo and armed ships, and distress signals were received at Malin Head. Hundreds of lives were saved. The wreck of the RMS Transylvania sits almost intact 135m below the water’s surface. She was being towed but sank before reaching the land. 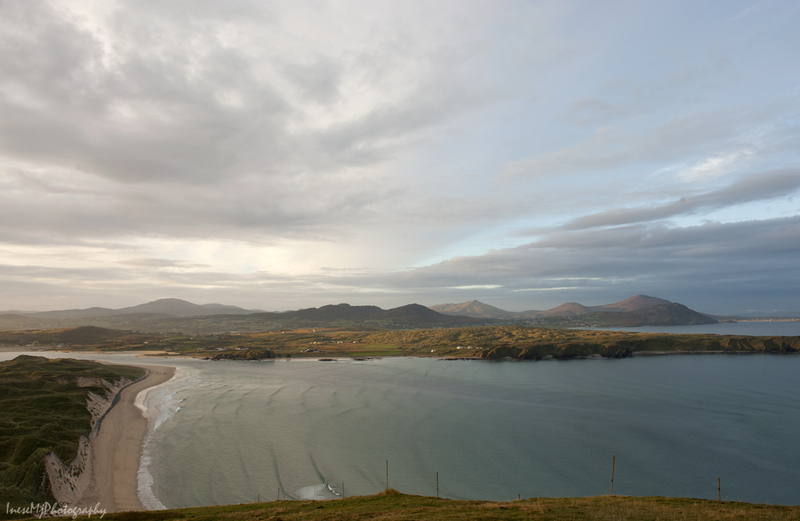 Another remarkable place you can see East from Banba’s Crown hill, is Ballyhillin Beach. This beach has its secrets. 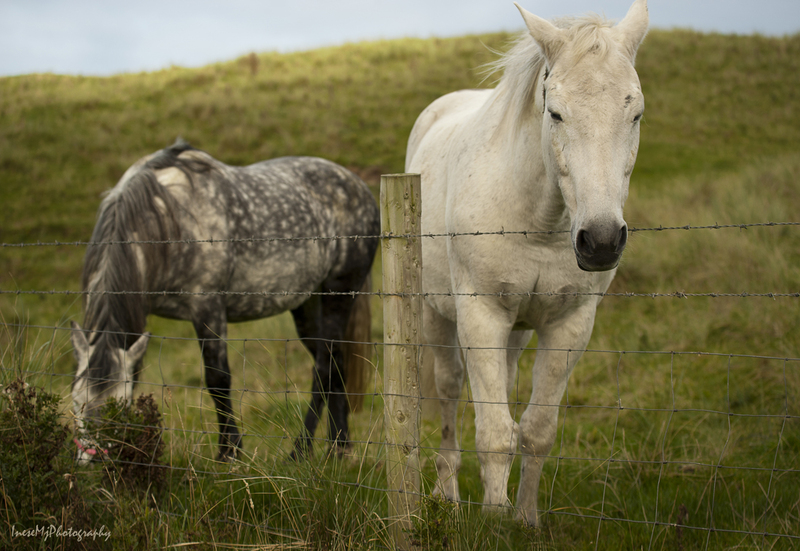 If you plan to go to Inishowen, don’t miss it. To add to my memories from July 2005, I want to share these pictures from December, the same year. 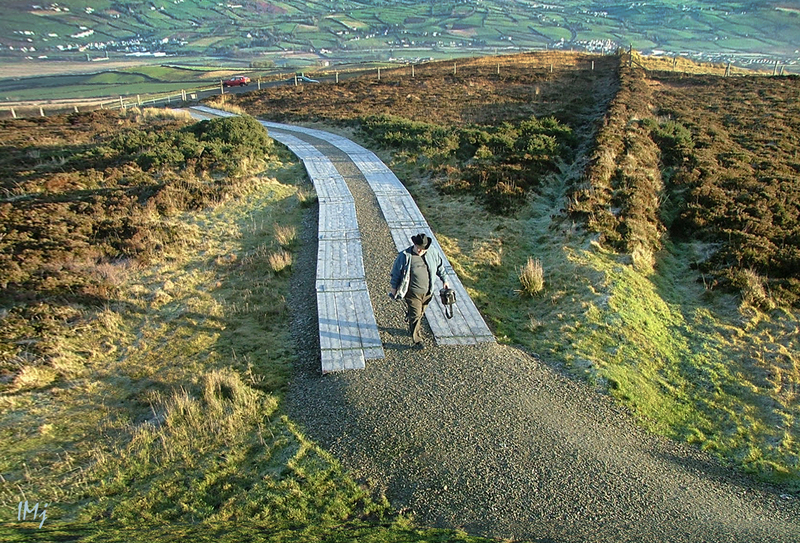 That time we didn’t travel around Inishowen, but checked it out from the heights of The Stone Fort of Grianán of Aileach. These are all the memories I have from 2005. Driving down the hill, I took a few more photographs, including the one with the sheep I posted in my first blog. The church in the images is a Roman Catholic chapel built in 1784. It has many amazing features that I hope to write about some other time. At the church I turned to the Five Fingers Beach to look at the sand dunes. They are not the largest dunes I have seen, but very beautiful. I didn’t dare to go to the beach because there was no one around, and I understand the word ‘quicksand’. I took this photo just to show how amazing is the grass that stabilizes the dune. I hope people understand that climbing can destroy protective coastal ecosystem that has been formed through the centuries. 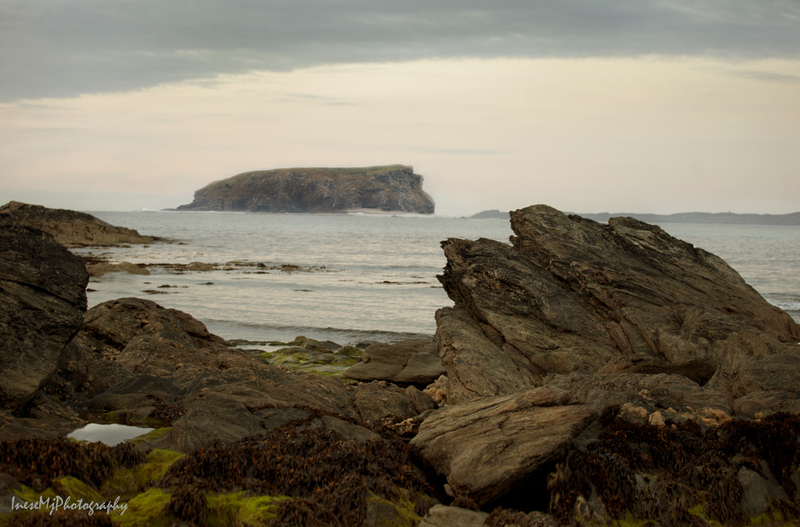 The Five Fingers Beach takes its name from the five sea stacks that are visible at low tide. The wreck of The Twilight, which sank in 1889 en route from Newfoundland to Derry, can also be seen when the water is low. The beach is sheltered by the cliffs and hills. This is The Soldiers Hill. My good-bye visit, as I already wrote, was to The Pollan Bay in Balliliffin, one minute drive from the Strand Hotel. I packed my car, checked out and hit the road. About my trip from Waterford to Inishowen and back I will write in a week or two. Now it is the time to confess that I hoped to seriously impress my readers, but the odds were not in my favor. Alas. Brendan Diver – Photos from Ireland – I will share his photograph instead . Just a few words about Brendan. He takes stunning photographs of the Northern Lights ( Aurora Borealis) – his images have been seen across the world on numerous TV News networks, such as RTE, BBC, ITV, Sky News, Good Morning America etc. 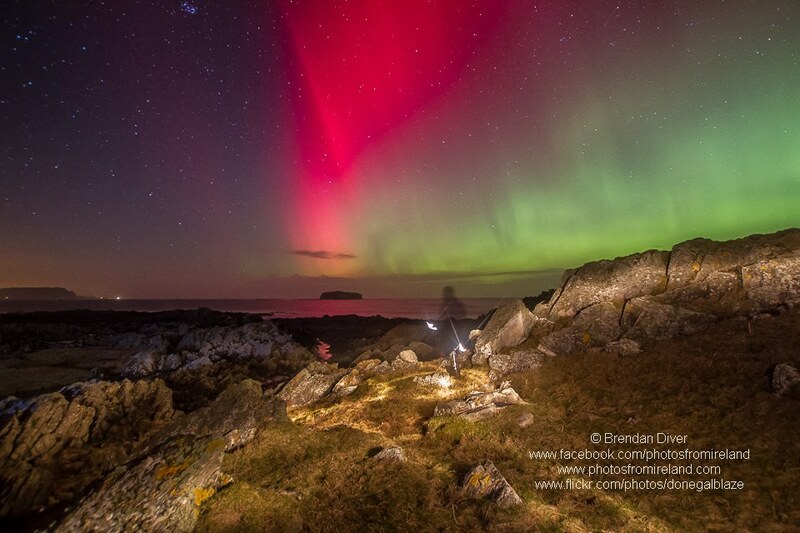 He was an official photographer during the visit of President Michael D Higgins to Inishowen in 2014; he was invited to photograph Colonel Chris Hadfield, Canadian astronaut who himself took amazing photographs of Aurora from space. He organized Elena Shumilova Workshop, and an extra night photography class, at which we were expected to take photos of said Aurora Berealis! No luck with that, there was no display of the Northern Lights in the area that weekend. For those who might plan their visit to Ireland next year, there are two more workshops scheduled in July. I wouldn’t hope for Aurora though. Fantastic! Wow! Thank you & I’m off to Brendan Diver’s blog. Whenever I read your posts, I feel like you have wisdom of two centuries..and you can show it not only in words but also in your photographs. Awesome! Thank you so much! 🙂 Very little wisdom, just some thoughts, observations and memories. Things repeat themselves. Life is much simpler than it seems. Wow, so beautiful! I would love to visit there one day. Thank you! 🙂 Do visit! Your photos are so beautiful, and tell us exactly why you love that area so much, Inese. 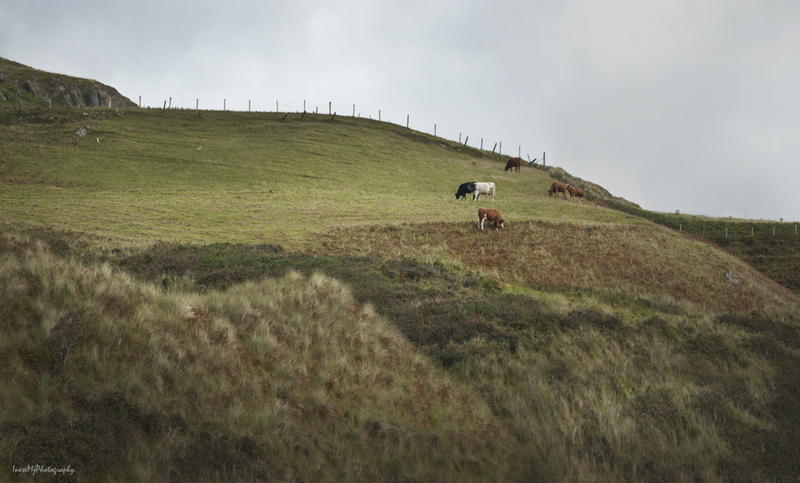 It’s so perfect – stunning countryside, an awesome coastline and a wonderful seascape. What more could anyone ask for? I’m truly impressed by Brendan’s photo of the Aurora Borealis, too. It never dawned on me that it would be so clear from Ireland. I’ve always thought I’d need to head to Northern Scotland (or even Northern Norway) to get views of it as perfect as that. Like most people, I share your feelings about the Paris tragedy. It’s been a very sad week. Thank you so much for your comment! 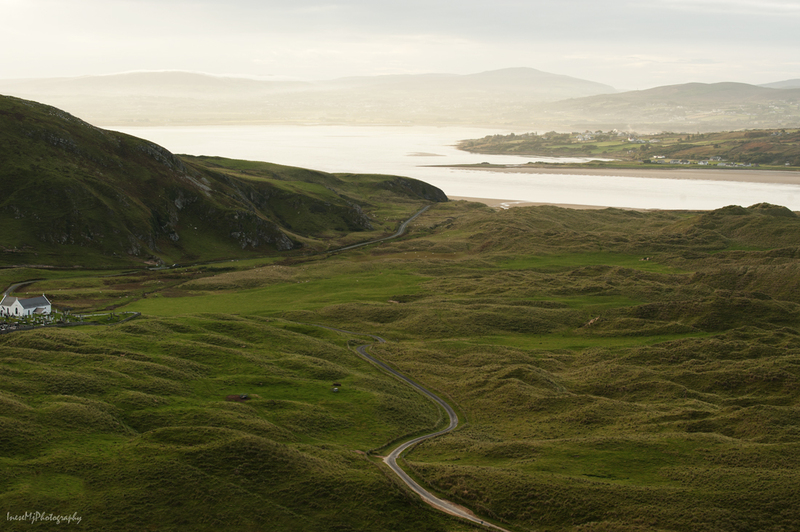 Inishowen is a relatively narrow stripe of land, and the landscape there is mostly coastal with just a little elevation in the middle of the peninsula. This makes it different. Aurora is not seen on a regular basis as I expected 🙂 There are some websites where you can check the possibility of the display in your area. I will go to Paris as soon as I have a chance, just to show that I am not afraid. I might go in May next year. I’ve heard several people saying they’ll go to Paris for the same reason you express, Inese. As you say, thoughts and prayers are with the families who lost loved ones. Tragedy doesn’t begin to describe it. True. There is no word to describe it. Wonderful photos and sentiments, particularly like the sound of the name – Five Fingers Beach! Thank you so much! I too loved the name. I would stay there all day if I had time. The quality of air is amazing there. Thank you so much! The sunrise was beautiful. No, that’s true, but the camera on his hexacopter is incredibly sharp. Amazing little thing. Interesting! Have you shared his photos on your site in the past? What amazing experiences you have had. Ireland seems beautiful from photographs. I’ve never been there but my sister visited in the early 1960s when she was working in England. Alas we have no Irish in our family, only English, German and Dutch! Breathtaking rich colors and scenery. Very nice set. Thank you Karin! Best wishes! Thank you for taking the trip with me! I really hoped for Aurora photographs, but there was no display at that weekend – not even close to our activity level number anyway. I will keep an eye on the tracking website, and if an opportunity arrives I will drive somewhere north-west for a picture. Thank you so much for your visit! You are most welcome Inese 🙂 Your blog is full of some amazing photos, it’s a pleasure to look at!! Thank you again, your words mean a lot! These are lovely photographs. Knockamany is quite the discovery. I’m glad you were able to find it again in the end. Thank you for your comment! I used to live near the sea, and sure we walked through the dunes, but we were encouraged to use the certain paths, not wander around. 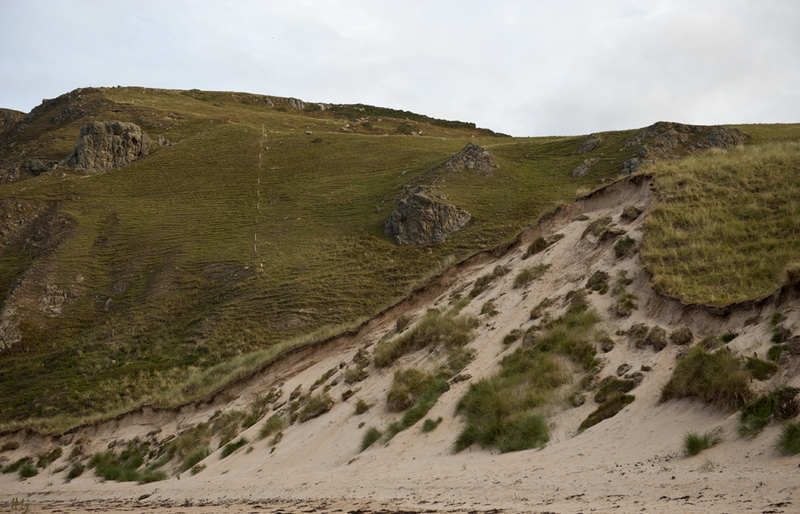 The walking areas were nearly flat – a good example of what would happen with our beautiful dunes after decades of mistreating. Stepping on the grass growth on the slopes can have a catastrophic effect. It is not like sandboarding in the middle of the desert:) These dunes are different and should be preserved. Lovely story and your pictures are just WOW. You really great at what you doing! What a fantastic array of beautiful photographs Inese. Wonderful. I totally agree with you about France. What a tragedy and waste of life again. Thank you so much David! Yes, waste of precious life. Reblogged this on Crazy Pasta Child. Such beautiful coastal scenery, lovely! I can see why they call this ‘the green island’. Thank you so much, Inger! Yes, green throughout the year. Truly a majestic post! And how cool to go back a decade later and with new gear – enjoyed the story to go with these gorgeous images (and a nice timing for this beauty amidst the heaviness w the France attacks) – anyhow – another take away was the cool warning sign – the entrapment and the I do not think I have ever seen a place – or sign – for real quicksand – always seemed like something of movies! And Diver sounds like a great artist! Thank you for your lovely comment! The post was already done last night. In the times of trouble we have to share beauty and kindness. Many years ago I watched the news and was in shock seeing two familiar faces among the hostages of Islamic terrorist – two children of my former coworker, in their twenties at that time. Thirty something people died that night, but they survived. Myself, I escaped a bomb explosion in a matter of a minute or less. One day I might write about that experience. Yes, Brendan has fantastic images of Aurora. Wow that is some experience – and I am sure In the right time the writing about it will happen – and interesting about the coworkers kids – wow. Oh and quick question – do u know who the person is on that bridge carrying a camera? Thank you! The man was there with his family. This place might be crowded in summer, but we traveled after Christmas. The wall is very high, as you can see. It was in the afternoon, and long, harsh shadows are no good for close up photography. I climbed the wall and made a few shots, but the wind was so strong that I could barely hold my camera. Cool back story ! And that photo is one of my favs from this post – I zoomed in and just exploded it – truly a great shot and great story to your experience – and this also hit home because 2005 was a turning point year for us – as was 95 in a way – so your whole ten year angle had me reflecting a bit too – and hard to believe it has been ten years since the events of 05! My my my /’should I say it ? Time flies – ha! Such lovely, peaceful countryside – ideal to sooth our troubled souls on this day. Thank you. Thank you for joining me! In real life, it was a very lonely trip. I believe that! Not much company except those lovely horses! You wouldn’t believe – not a soul! Well, it was early in the morning, but still… I was expecting the worst, but it came out I could drive in the middle of the road and stop for a picture wherever I fancied. These are just beautiful Ines. Today more than most I appreciate the chance to share in a virtual journey to a place of natural beauty. These days I get such solace and strength from nature and your post is a tonic. Thank you. Su, thank you so much for your comment! Turning to the nature for comfort and wisdom, it is what humans need if they don’t want to destroy themselves. And may also help us to stop destroying the natural world which sustains us. True. People do so many wrong things, and for so many wrong reasons. What a soothing post on such a dark day in global terms. I love the sound of your 2016 project! Thank you for your lovely comment! Yes, it is not a good day, but we have to live through it. I am afraid the days like this one will follow, and most of us will wake up in the morning and keep going. Beautiful photographs, and a wonderful post. Thank you so much Nicodemas! I like the first photo with the rolling green hills. It looked so inviting to explore. Be well. Thank you! It was taken in 2005 🙂 Have a peaceful Sunday! Thanks so much for sharing those fabulous photographs, Inese. 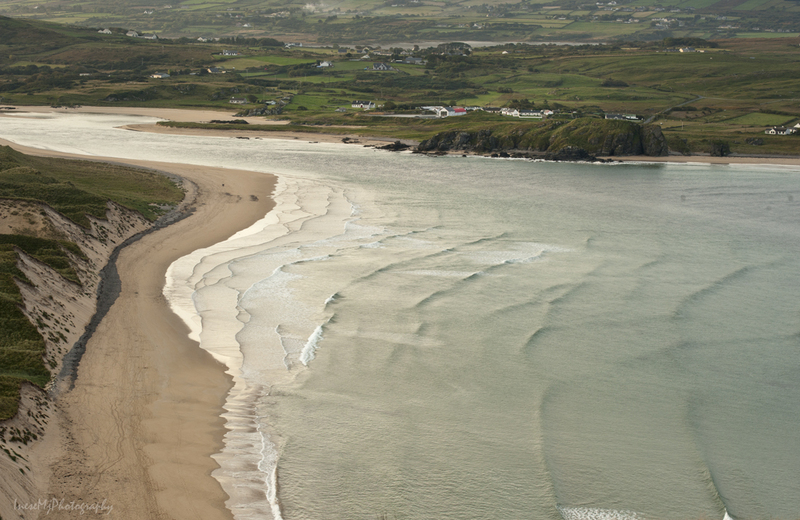 My daughter and her husband and children live in Derry and on our visits we often take a drive along the coastal region. Beautiful countryside. Recently we spent a weekend in Donegal and that too has wonderful scenery. So glad you enjoyed the trip to Inishowen! I have been in Derry many times, and love the city. Scenery is outstanding. I have got a glitch in WordPress today, and had to manually link the pictures to their larger size, so you can look through them again 🙂 Thank you so much for your visit and comment! Gorgeous! One of these days…. Oh yes… Thank you so much, glad you enjoyed the pictures. PS Just manually linked all the images to their larger size. I was in Paris in 2006 and in 2013. In my worst nightmares I didn’t see it coming. I’ve been to Paris a few times and have such warm memories from my last visit. Sad. Yes, sad. It was a long, decades long process, and I don’t see any happy end here. PS Just manually linked all the images to their larger size. WordPress glitch. Thank you friend, your comment means so much! These pictures are my memories, and I want them to speak. I took a trip today–with you, to a very special place, indeed! Thank you for sharing the beauty. I haven been to the south but not the north of Ireland. I would love to go more than ever now, thanks to you. 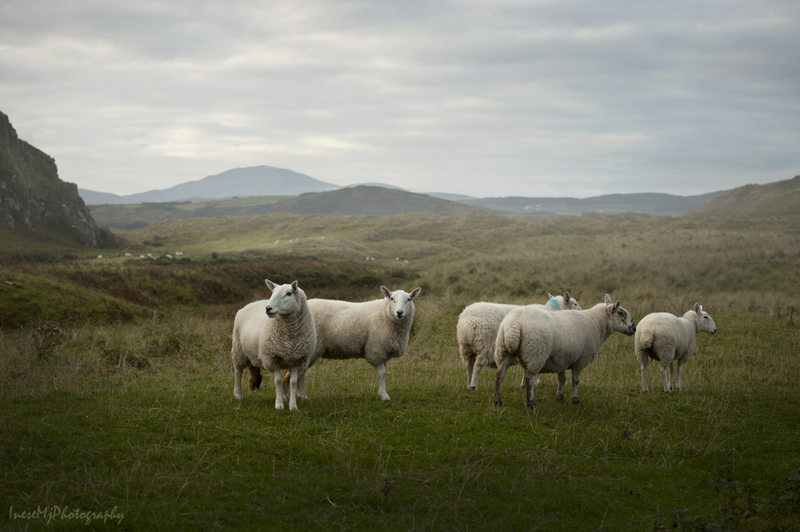 I like the wide open field scenery of the places (or many places in Ireland that I have seen). They give feeling free and calmness together. Your 2016 project sounds very good. Thank you so much for your comment! Peaceful place indeed. 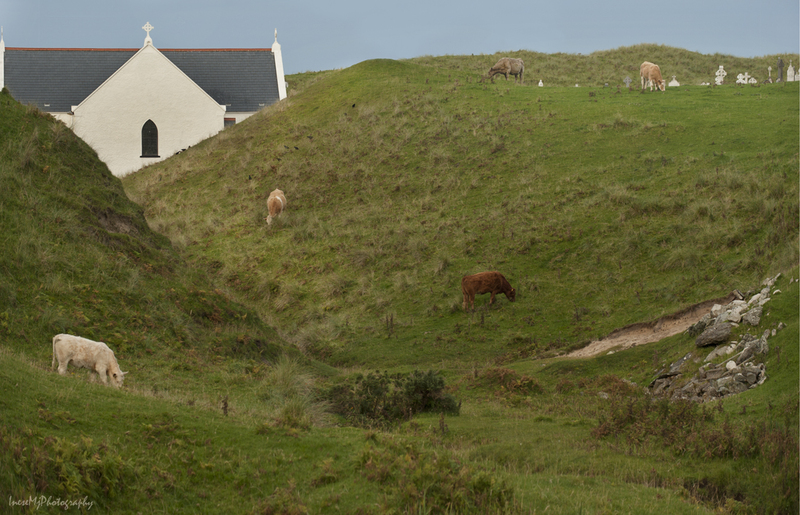 More lovely pictures, especially the one of the chapel peeping over the cleft with cattle on it. Thank you so much Derrick! This chapel is so peaceful and situated so neatly in the hills, I loved it! Yes, and I don’t know what to do. I wrote to support, but how is it going to help if the blog is already published, I don’t know. Pity that all these pictures are just useless thumbnails. They are certainly not useless. Thank you so much for your kind words, Derrick! I shouldn’t upset myself with such unimportant things, especially now when some people are balancing between life and death. Majestic indeed, Inese! Such a magical looking place — it’s easy to imagine it sticking with me forever if I ever visited. Thanks so much for sharing this beauty and your thoughts about it. Mega hugs! Thank you so much Teagan! Can you click on the images to enlarge them? I cannot, and it makes me frustrated – I cannot believe my WordPress glitch is back again… Hugs!!! No… but I can always make my screen larger (which I always do, since bats see better than me!). It’s possible that it times out before doing what you want. WordPress froze up completely with me two times this morning while I was working on my “Atonement, TN” post… In other words, neither your post nor your pictures may be the culprit but WP. Thank you Teagan! So it is their fault… Hope they answer my letter and fix it so I can update the post without deleting and re-publishing it, because who is going to write me all these lovely comments again? 🙂 Hugs!!! How beautiful it is, the Irish coast, excellent shooting Inese. Thank you so much, I love this land. Thank you for your comment! Peaceful land it is.